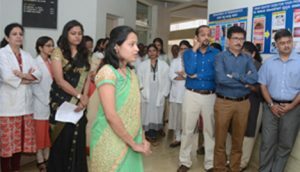 Department of Periodontics at S.D.M College of Dental Sciences and Hospital (SDMCDS&H), Dharwad celebrated Oral Hygiene Day on 2nd of August 2018 to commemorate the birth anniversary of Dr. G. B. Shankwalkar a pioneer of Periodontology in India. 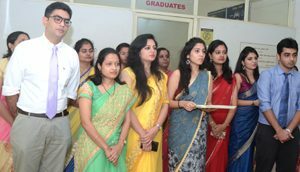 The programme was inaugurated by our beloved Principal, Prof. Srinath Thakur in the presence of Dr. Anirudh B Acharya, (Head of the Department of Periodontics), Dr. KVV Prasad (Dean, Academics) Dr.Venkatesh Naikmasur (Dean, Administration), other faculty members and students were present. 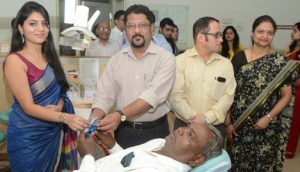 Free basic periodontal treatment was provided to all out patients on this day with distribution of oral care products. The programme comprised of essay competition ‘Scope of Periodontics as a Speciality – A reality Check’, open to all under graduates, house surgeons and post graduates for which I & II prizes with a cash prize of Rs.1000/- & Rs.800/- respectively was awarded. 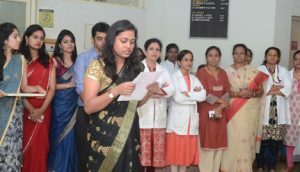 The Department conducted an oral hygiene awareness programme at Vithal Institute of Child Health Care and Speciality Center, Dharwad which included a lecture by Dr. Pragati Bhat and oral care demonostration by the post graduates. 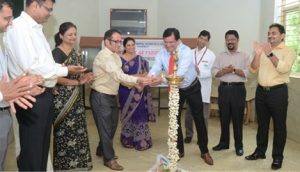 The Department of Periodontics was one of the 20 from all over India to be selected to host the Listerine Lecture series by the Indian Society of Periodontology. This lecture series was delivered by Dr. Leena Shettar, Professor. In addition, oral hygiene awareness programme was held in association with Rotary Club, Dharwad Central.